With three straight wins over Philadelphia, the Milwaukee Brewers have put some distance between them and the Phillies in the “race” for the worst record in baseball. The Phils are 27-53 (a .338 winning percentage) and the Brewers are 32-48 (.400), the second-worst record in the majors. Since the Brewers came to Milwaukee in 1970, the Brewers have never had the worst record in baseball in a season. Even with some very lean times for the franchise, the Brew Crew are one of only seven franchises to have not had the worst record (or tied for worst record) in a season since 1970. The others: Boston, Cincinnati, Colorado Los Angeles Angels, New York Yankees and St. Louis. Should the Phillies end the season with the MLB’s worst record it would be the second time for the franchise since 1970. 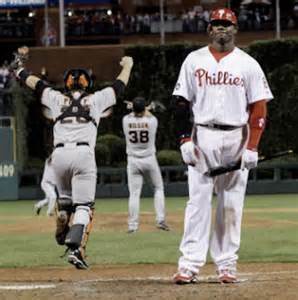 In 2000, the Phillies and Cubs tied for the worst record in baseball (65-97, .401). The franchise with the most worst-record seasons in the majors since 1970 is Detroit. The Tigers have had the worst (or tied for the worst) record in baseball five times since 1970. Here’s a look at the number of times/seasons each franchise has had the worst record in baseball since 1970.